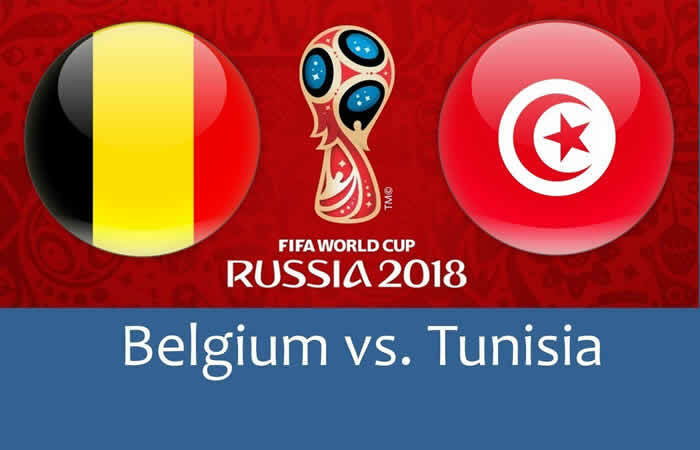 The clash between Belgium and Tunisia will be played at the Otkrytiye Arena in Moscow on June 23rd. The Red Devils met expectations with a solid win over Panama, while Tunisia almost made a surprise as they held England to 1-1 until the injury time when Harry Kane’s strike earned a victory for the Three Lions, so the Eagles of Carthage cannot lose here if they want to keep their World Cup dreams alive. Belgium justified the role of a huge favorite at -500 with a convincing 3-0 victory over Panama in the opener, but not everything went their way in the first 45 minutes as they failed to penetrate through Panama’s sturdy defense. However, Dries Mertens scored a beautiful volley to make it 1-0 only two minutes after the interval, while RomeluLukaku scored twice to set the final score, 3-0, so in case you backed the -2 spread on the Red Devils at +106 and over 2.5 goals at -141, the Belgians made sure that you make profit on this one. On the other hand, Tunisia fought bravely against England and responded to the Three Lions’ early lead with a goal from the penalty spot in the 35th minute, but that was all we saw from the Eagles of Carthage. Sassi’s goal helped the punters who had both teams to score at +140, while Harry Kane’s header in the 91st minute brought a joy to those who bet on over 2.5 goals at +130. RomeluLukaku has two goals to his name so far and he is one of the candidates for the Golden Boot at this World Cup, so I expect him to find the net at least once in this tilt as he will likely be the one to torture the Tunisian defense. WahbiKhazri didn’t enjoy the best of games against England and the Tunisian captain is desperate to bounce back here, so he is the man to watch for the underdogs, and if Tunisia manages to come near to score, he could be involved. Belgium: Courtois; Alderweireld, Vertonghen, Boyata; Meunier, De Bruyne, Witsel, Carrasco; Mertens, Hazard, Lukaku. Tunisia: Ben Mustapha; Meriah, Ben Youssef, Bronn, Maaloul; Sassi, Badri, Shkiri; Sliti, Khazri, Ben Youssef. Belgium’s chances to lift the trophy in Russia are +800, while the Red Devils are -227 to make it to the quarter-finals. Tunisia’s chances to win the World Cup are up to +150000, while the Eagles of Carthage are +3300 to reach the quarter-finals. The Red Devils to win at -303 is surely not as attractive as the -1.5 spread at +110, and Tunisia showed nothing to convince us they can pose a threat to the Belgians here, so the favorites should win with at least two goals difference.